Fighting slavery: What role for International Criminal Justice? This policy report presents a series of practical recommendations for narrowing the gap between the strong international law against slavery and its weak enforcement. It draws on the discussions and conclusions developed in a joint projects of United Nations University, the Freedom Fund and the Permanent Mission of Liechtenstein to the United Nations, which will culminate with the publication of a Special Issue of the Journal of International Criminal Justice on this topic in early 2016. A list of the articles and their authors are annexed to this report. The report also serves as a companion to another policy report, Unshackling Development: Why we need a global partnerships to end modern slavery, produced by the United Nations University with the support of the Freedom Fund. 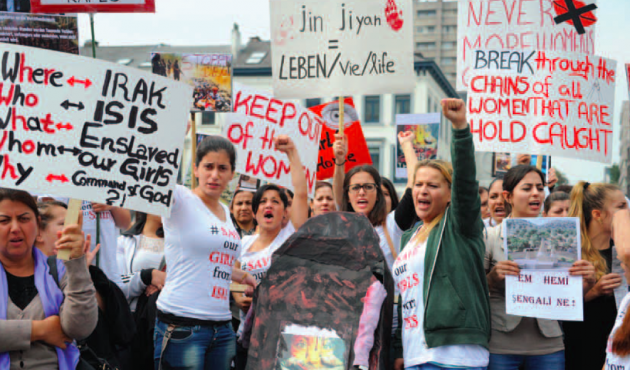 Image: Yazidi women hold banners and chant slogans during demonstrations against the attacks of Islamic State (IS) in Iraq in front of the European Parliament in 8 September 2014. Credit: Dursun Aydemir/Anadolu Agency/Getty Images.